Clifford Chanin ’75 never expected the two topics he had been working on separately for years would ever intersect. But that’s exactly what happened on September 11, 2001. 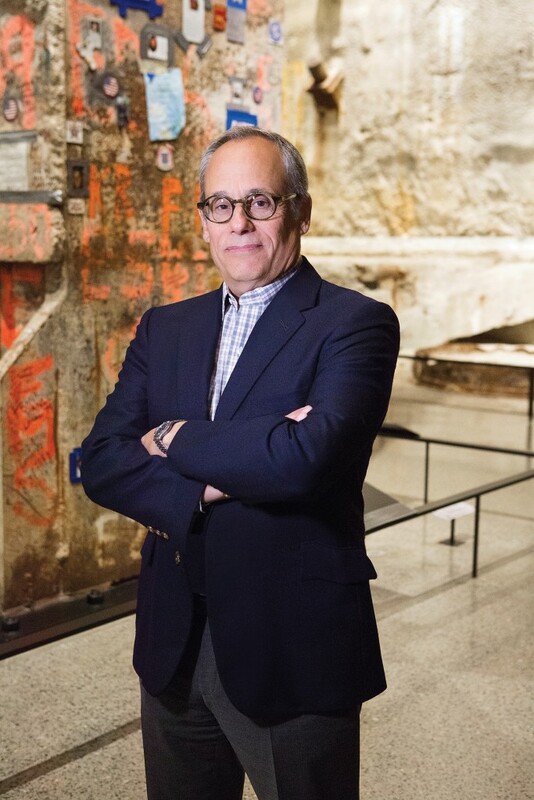 Clifford Chanin ’75, vice president for education and public programs for the 9/11 Memorial Museum in New York, in the museum’s soaring Foundation Hall. Photo: Robert Adam Mayer. “The first thing people tell me when I tell them where I work is where they were on 9/11,” says Clifford Chanin ’75, sitting in the café of the 9/11 Memorial Museum in New York, where he is vice president for education and public programs. As overwhelming as it was, that experience sparked what became a lifelong interest in the intersection of memory and trauma. After returning from Europe, Chanin spent close to five years in journalism and in politics, working as a reporter and serving as a spokesperson for New York City Mayors Ed Koch and David Dinkins, before joining the Rockefeller Foundation in 1990. Visitors write messages on interactive tables in front of a steel column from the South Tower, folded over onto itself during the tower’s collapse on 9/11. Photo: Jin Lee/911 Memorial. 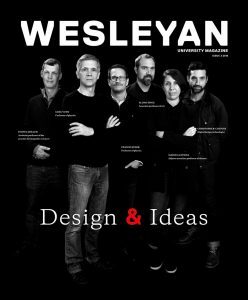 While Chanin had no idea where The Legacy Project might take him, what he never expected was for the two topics he had been working on separately for years—Muslim world development and the intersection of memory and trauma—to ever converge. But that’s exactly what happened on September 11, 2001. 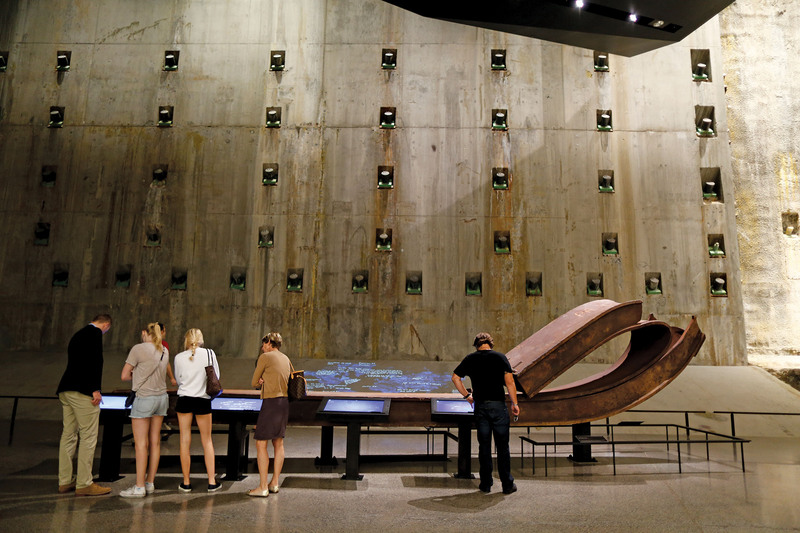 Almost immediately, Chanin began consulting on a variety of projects, including the startup of the 9/11 Memorial Museum in May 2005, when the foundation was first constituted. By the time the museum opened in 2014, Chanin had already curated the fifth and 10th 9/11 anniversary exhibitions, edited two books (a third is on its way), produced two original 15-minute films now shown throughout the day in the museum’s auditorium, and planned the museum’s educational programming. More than 4.1 million visitors from all 50 states and more than 150 countries have visited the 9/11 Memorial Museum since it opened in May 2014, cementing its status as an international place of pilgrimage. Within the museum walls are 12,500 artifacts, 23,000 still images, 1,990 oral histories, and 580 hours of video that work together to tell the story of the day, what came before, and what comes after. All personal recordings and effects were donated by and used with the permission of the families of those involved that day. Along with the physical objects on display, the museum’s holdings include a wealth of digital and electronic material that open up the story, providing visitors with a sense of intimacy and connection. “Because I’m interested in the subject of memory and how we remember things and why it’s important for us to remember, for me the story of 9/11 is not just about the sadness of loss but also about the resilience of the human spirit,” says Chanin. 1. 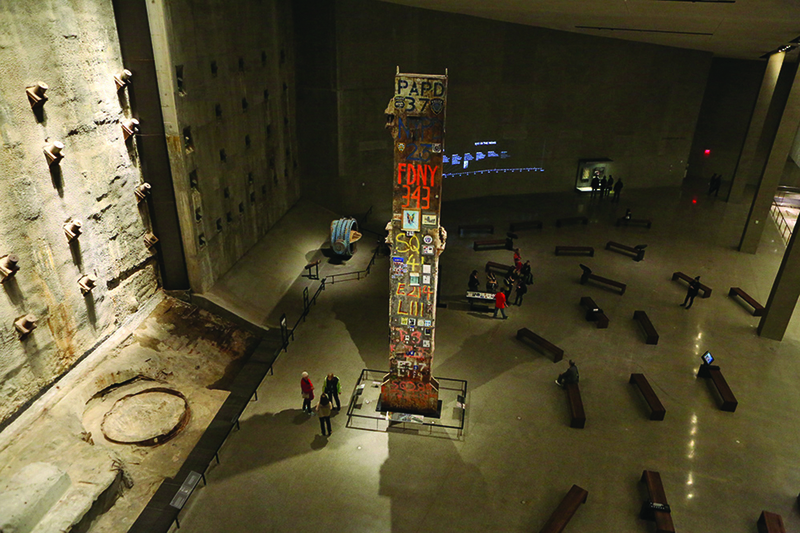 The 36-foot-tall Last Column was a symbol of resilience to the thousands of recovery workers who spent months excavating the World Trade Center site after 9/11. Part of the core structure of the South Tower, the 58-ton beam was covered with words and numbers, pictures, and tributes by workers during the recovery effort. Photo: Robert Adam Mayer. 2. For months after 9/11, a replica of the Statue of Liberty stood honor guard outside the firehouse of Engine 54/Ladder 4/Battalion 9, which lost 15 of its members at the World Trade Center. 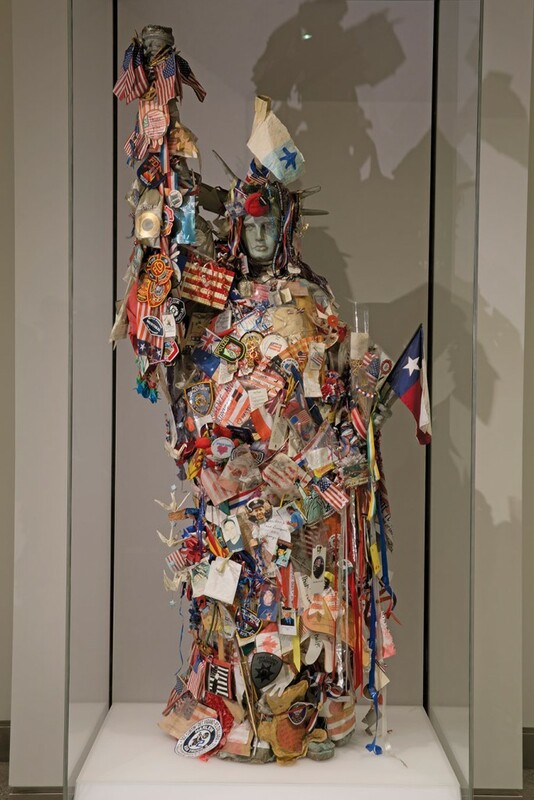 While no one knows where she came from or who put her there, Lady Liberty’s presence encouraged an ongoing outpouring of messages and offerings in tribute. Photo: Jin Lee/911 Memorial. 3. 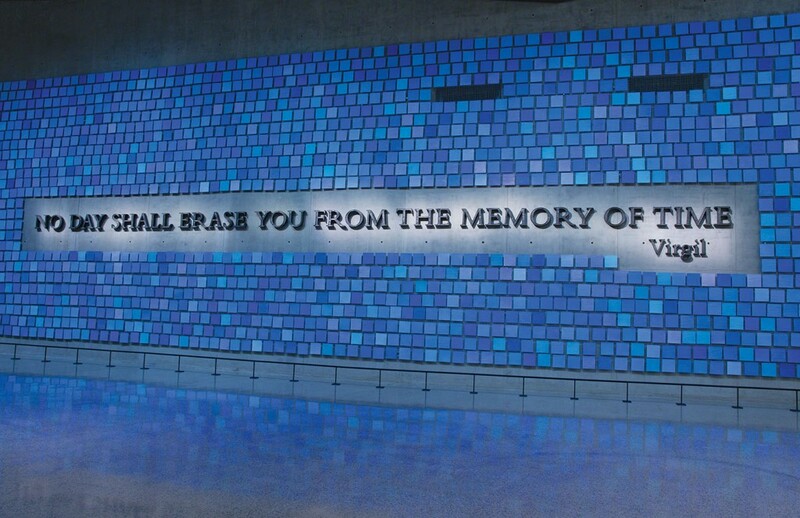 “No day shall erase you from the memory of time,” a quote from The Aeneid, by Virgil, forged by artist Tom Joyce from steel recovered from the World Trade Center, reflects the museum’s mission to honor and remember. Surrounding the Joyce work is an installation by artist Spencer Finch, “Trying to Remember the Color of the Sky on That September Morning,” which features 2,983 watercolor squares—each its own shade of blue, each representing a victim of the 2001 and 1993 attacks. Photo: Jin Lee/911 Memorial. 4. 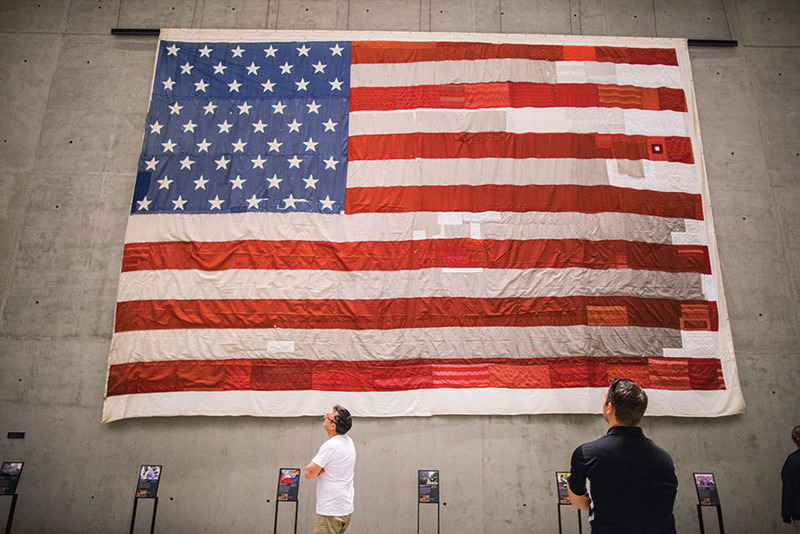 The 30-foot-wide National 9/11 Flag originally hung on a building across from the WTC site. In 2008, the tattered flag began its cross-country journey with the New York Says Thank You Foundation, an organization dedicated to paying it forward by helping other communities touched by disaster. Using thread and patches from decommissioned American flags from all 50 states, including material from the flag on which Abraham Lincoln was laid after his assassination and threads from the flag that inspired Francis Scott Key to pen “The Star-Spangled Banner,” the National 9/11 Flag is a symbol of civic pride and the spirit of volunteerism. Photo: Jin Lee/911 Memorial. 5. The Vesey Street stairway served as a route to safety for many on 9/11. 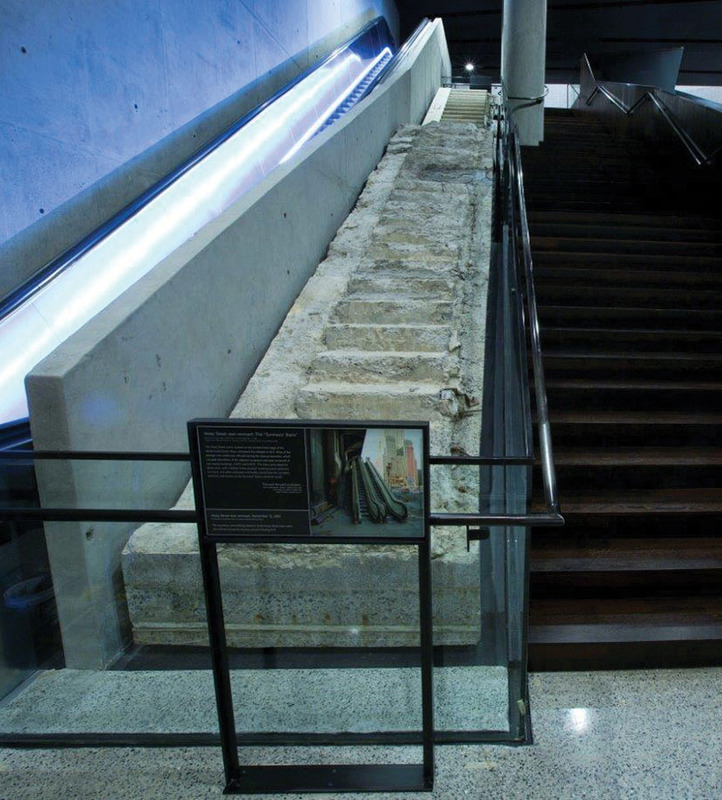 Known as the “Survivors’ Stairs,” the steps were left mostly intact that day but sustained significant damage during the nine-month recovery period at the site. Photo: Jin Lee/911 Memorial.